If you are a new parent, congratulations! However, you know your life will come to a complete standstill for a few months. After that, you can finally step out with your child, but you need to carry numerous things with you for just one outing. You can carry a regular bag for everything, but they tend to make things messy and unorganized. Thankfully, there are multifunctional diaper bags today, and we are reviewing three of the best messenger diaper bags. Diaper bags are an ancient concept, and surely even our parents had used them when we were toddlers. Nevertheless, you know that those bags tend to look very boring and lack any sense of style. Today, those kinds of bags are not acceptable. With more people being style conscious, makers of diaper bags have to factor in the style quotient of the bag. No parent wants to be seen with a boring diaper bag. This article particularly aims at providing you three choices of the best messenger diaper bags. Each of these is stylish and packed with a lot of features. They indeed will not resemble a diaper bag, but will serve the purpose successfully. The Skip Hop Diaper Bag is great for those folks who like a very simple yet stylish bag. It is compact, and its dimensions are 12.5 x 4.25 x 12 inches. It is very light in weight, specifically 1.7 pounds. The bag is quite sturdy and is made from a 100% polyester material and will surely last you even if and when you plan on having another child. It is available in three color choices and design namely black, gray and a very cool looking white and light gray chevron design. Thanks to the neutral color and a unisex design, this bag suits both moms and dads brilliantly. 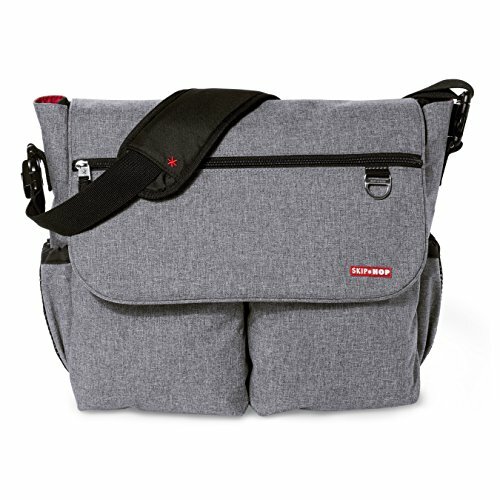 This messenger-style diaper bag is not just trendy but also has unmatched functionality. All in all, this diaper bag has 11 spacious pockets for easy access and storage for all essentials. The company has designed a space for every single product your baby needs when he or she is on the go and also another zippered compartment for you to store your personal belongings. There are two pockets on the side of the bag which offers space to keep the baby’s bottles. The company has also included their patented Shuttle Clips on this bag. These clips will allow you to convert this bag very quickly and conveniently from a shoulder bag to a stroller bag. When it is attached to the baby’s stroller, you can either keep the strap or leave it for a better and cleaner look. Additionally, there are also magnetic closures with a comfortable shoulder pad. Also, the front pocket comes with a custom D-ring to hang toys to ensure that things don’t get lost inside. Likewise, the company has included a contrast lining stitch. Moreover, you can be assured that this product is safe as it is free from phthalate. The color isn’t exactly what it seems like in the pictures. 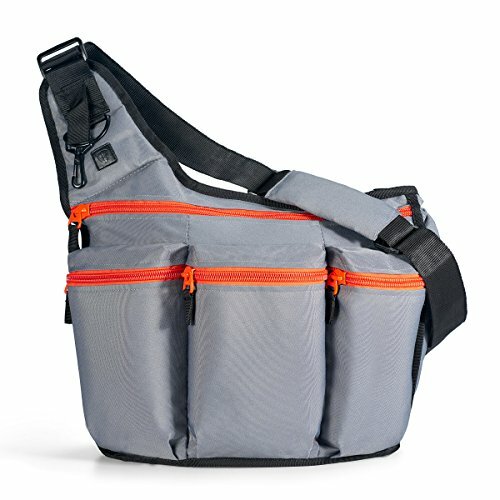 The Diaper Dude Bag is targeted especially for all the dads out there because it has a unique and sporty design. It comes in five colors which are black, gray, navy, brown and pink, and camouflage. This bag is designed keeping in mind what men like, although, it looks great even on women. It is made from polyester and nylon, which makes the bag highly durable. This messenger bag has an ergonomic and across-the-chest kind of design. Moreover, it comes with an adjustable strap that is padded for your comfort. This strap is large and comes with an easy on-and-off clip for quick access. Not only is this bag spacious but it is also compartmentalized which allows you easy access. The diaper bag can comfortably accommodate a couple of diapers with a few extra clothes. You can also carry snacks, toys, blankets and the likes. For additional space, the company has included three large zip-close pockets for quick and easy access to things. The bag can be spot cleaned. 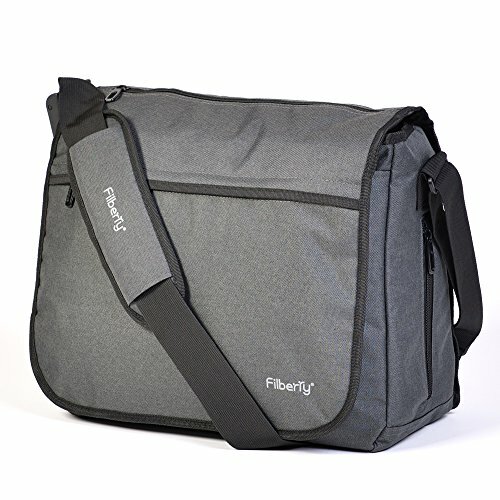 The Filberry Messenger Diaper Bag is a very simple looking, across-the-shoulder bag and is available in gray color. This bag works great for moms and dads. The simplistic design makes it easy to carry around and will match whatever you are wearing. Its dimensions are 15.75 x 13.5 x 6.75 inches. This diaper bag in total has 11 pockets. There is a large and deep main compartment which has four pockets that are elastic. In the front of the bag, there is a pocket large enough for a changing pad. To keep the bottles in place, there is a side mesh pocket, and another side insulated pocket to keep the bottle warm. Also, to keep the soiled clothes, there is a pocket at the bottom. Further, to store your valuables for quick access, there is a front zippered pocket. The bag has a quick-access flap which can be used with just one hand. It’s also easy on the shoulders—thanks to the comfortable padding and adjustable straps. As a bonus, the company offers a complimentary diaper bag set which includes an extra-large changing pad, a detachable cell phone pocket, and an additional insulated bottle space. This bag is great if you have twins and the company has a 100% lifetime guarantee in case there is an issue with the bag. The design is a little too simple. The Velcro used to close the strap isn’t too effective. Choosing any one of these three best messenger diaper bags will leave you very happy. They’re all stylish, unisexual, and have great functionality. However, if we had to choose one, our pick would be the Skip Hop Diaper Bag. Amongst the three, this is the most stylish of them all. It is comfortable to carry around, and best of all, there is ample space within which helps keep things organized.